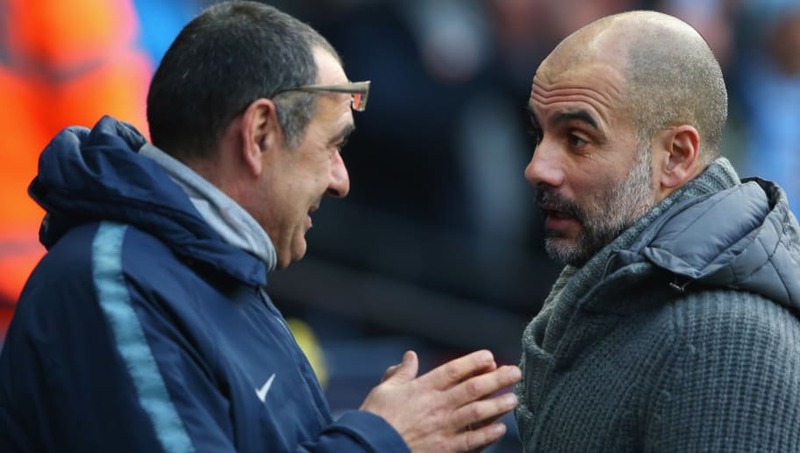 Manchester City boss, Pep Guardiola, has urged the fans to be a bit patient with Maurizio Sarri, claiming that he knows what the Italian is trying to achieve at Stamford Bridge. The Blues were outplayed by a ruthless City side at the Etihad Stadium on Sunday night. Sergio Aguero, Raheem Sterling, and Ilkay Gundogan got themselves on the scoresheet, combining to put Manchester City 4-0 ahead just after 25 minutes of play. The 6-0 defeat at City was ​Chelsea's third consecutive Premier League defeat away from home. They have conceded 10 in their last two outings, without reply, putting even more pressure on the under-fire Italian manager. Sarri, however, is adamant about sticking to his philosophy, claiming that his job is always "at risk." In the reverse fixture, Chelsea demonstrated commendable discipline and character to hand the reigning champions their first Premier League defeat of the 2018/19 campaign. Pep Guardiola didn't show any mercy picking Chelsea apart at the Etihad but has backed his Chelsea's counterpart's ideals. "I know what he wants to do," the City manager said, as quoted by Reuters. "They want to try to do it, they beat us at Stamford Bridge. The people don’t understand how difficult it is to do something." "The people expect that it immediately comes, it needs time. It only is the belief of the owners," the Manchester City boss concluded.